Historically, I am not much of a hunter…I'm way more the gatherer type for many reasons including an insatiable love for a wide array of vegetables (I do have a favorite camo hat, I will admit). My inclination would be to stay away from anything having to do with hunting for my love of animals but as I learn more about good hunting practices, my love for animals is what draws me to the hunt. Since not everyone has the time to go out on missions for foraging and hunting (not to mention that many of us are city-dwellers), we are lucky to have many great grocery stores. When you visit the local food co-op or Whole Foods, you can find a humane-treatment and quality standards code to help you understand a little more about how the animals were cared for during their life. Pasture-fed, grass-fed, cage-free, free-range etc. are all part of a list of terms that can help shoppers in selecting meat (or fish) that have a low-impact on the environment. These can also help teach us about whether our food comes from near or far. All of the terms floating around the meat-counter can seem overwhelming to some (myself included) especially on a day when the goal is to just get home and out of the snowy traffic to get that dang meat-loaf in the oven, kids fed and finally, the finish-line, feet in comfy slippers resting on the ottoman. To add ease to your mission (and mind), let the meat department answer your questions and find what works for your needs. The informed staffers often have the inside scoop on what's coming into the store and any news from the farms that may effect taste, quality and availability of items. Take the time to talk to these helpful folks and you might just find yourself on an adventure with a new cut of meat. Before I tried venison for myself, it seemed that I kept hearing of bad experiences and very few positive reports. This could have kept me from it but a hundred pounds of venison coming from the butcher post-hunting season said that I better think of a new plan. I did and it was fantastic! This was greatly encouraging and pushed me to be open to trying new sustainable meat or protein sources on my kitchen table. What I have found to be most true when it comes to food is that it's most important to find what works for you, your body, your family and your beliefs without ruling anything off the menu before trying it. The first time that I attempted to prepare venison, I felt lost. Having never before even tasted the lean red-meat, I probably just stared at the white butcher-paper wrap for a while wondering what my next move would be. I settled on a marinade and cleaned up the grill. A few hours later, much to my surprise, it was delicious and juicy. I couldn't wait to get started on more recipes. Every negative opinion that I had ever heard about tough or gamey meat had been officially washed away and replaced with shear delight… and a greater connection to my home-state of Minnesota. I can now say that I love venison. Hunting seasons are put into place for population control and to be sure that there is enough food for the deer that inhabit our woodlands. Following good, fair and lawful practices, hunting is the best way to nourish my body and still insure that my moral and environmental beliefs are met. Venison is a very lean red-meat, more so than beef, which is just one of the many reasons why it is now a kitchen staple for this Minnesotan. Plus there is nothing better than a deep freeze full of steak that you or someone close to you was incredibly proud to bring home. This is a true sense of pride more than anything store-bought could provide. When you hunt your own, the labels can fade away and you can return to nature. To me, venison is the ultimate locally sourced, free-range, plant-fed meat. In a large skillet, heat 2 tablespoons oil over medium heat. Season meat with salt and pepper. In batches, cook meat until browned on all sides, about 10 minutes. Place meat into a slow cooker. Saute onion in same pan, scraping brown bits from sides, until soft. Add to slow cooker along with garlic, oregano, bay leaves, rosemary, red pepper and broth. Cover and cook until meat is fork-tender, about 5-6 hours. About 1 hour before venison is ready. Mix horseradish and buttermilk in a small bowl. Set aside. About 45 minutes before venison is ready. Bring a large pot of water to a boil, add potatoes. Boil until fork-tender and remove from heat. Drain water and leave potatoes in the pot. Mash with a fork. Fold in desired dairy and season with salt and pepper. Place potatoes in individual plates or one large serving platter. 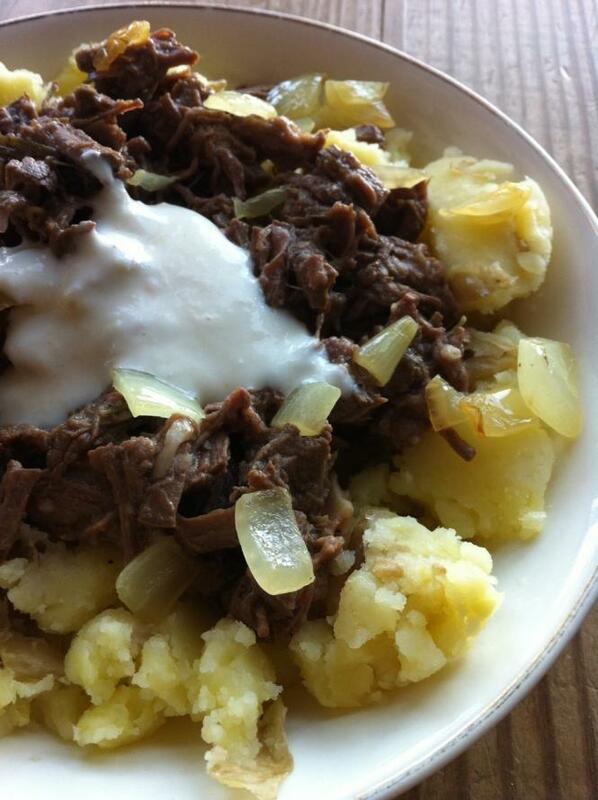 With a slotted spoon, add venison from the slow cooker to the potatoes, removing any leaves from the herbs. Drizzle with horseradish sauce and add any desired toppings. Serve warm and enjoy on a cold winter night! What more on hunting? 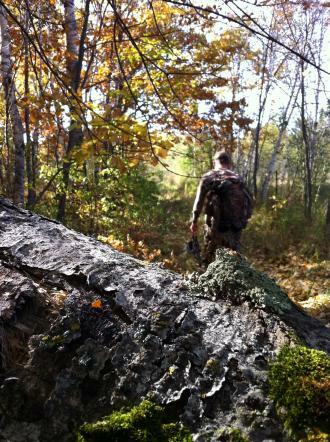 Check out this article on Modern Technology and This Year's Deer Hunting Opener from 2010. Rachel Huntzicker is a writer, practitioner of yoga and clean foodie with an evolving desire to learn more about sustainable whole living and the food-to-mood connection. From her evolving and ever present desire to learn, she came to conclusion that growing her own quarter acre organic garden was a must. Follow her journey on her blog, the Woodland Garden. Her last article for SGT was: Homework never tasted so good.